Butter two ramekins for a main dish, four for an appetizer portion. Heat oil and 1 Tbsp of butter over high heat in a skillet large enough to hold the scallops. Sprinkle scallops with salt and pepper and lightly sear on each side for about a minute, do not overcook. 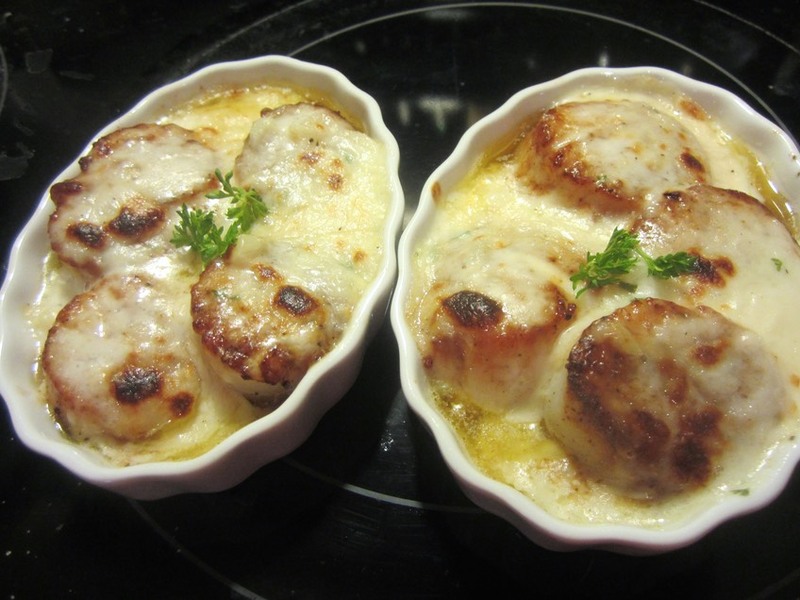 Divide scallops evenly between prepared ramekins. In same skillet, bring Vermouth, garlic, tarragon, bay leaf, salt, and ¾ cup water to a boil over medium heat. Boil liquid until reduced to ½ cup, about 10 minutes; strain. Heat 2 Tbsp butter in a small saucepan over medium heat. Add flour; cook until smooth, about 2 minutes. Add reduced cooking liquid and cream; cook until thickened, about 8 minutes. Preheat broiler while sauce is cooking. To the sauce, add cheese, parsley, lemon juice, and salt, and pepper to taste. Thin with extra cream if necessary. Pour the sauce over scallops. Broil until browned on top, about 3 minutes. Enjoy!